86% of truckers on the road today are overweight, and most are obese. It is no secret that being on the road makes it very hard for drivers to stay healthy; and when you make the investment to become an owner operator, being on the road is necessary for your business to grow. How can you find balance to stay healthy AND get in the miles? Here are our tips. Just like you plan ahead for your routes, stops, breaks and loading times, plan ahead for staying healthy on the road. One of the number one tips of most fitness and health coaches is to plan out your food for the day before you ever stick a fork in your mouth. Planning prevents you from making bad choices when hunger inevitably strikes. Planning also prevents you from waiting too long to eat and having blood sugar surges that fuel bad decision making. When you are on a break, take a few minutes to cut up some fresh fruit and package it in small storage containers. Put a portion size of roasted almonds or trail mix in snack size bags. Start a meal in a crock pot. Just 10 minutes of preparation can save you from bad decision making due to hunger and time constraints. As much as possible, try to build in daily routines and schedules. Having a schedule that is relatively consistent allows you to build habits that contribute to your health. For example, if you need to lower your blood pressure and you want to try relaxation techniques to help, you need to purposely set aside time for deep breathing, stretching, and meditation. If you do, you are more likely to develop those good activities into actual habits...and lower your blood pressure! Besides the sedentary nature of the job, one of the biggest struggles truckers have is to have a consistent schedule. Even if your schedule varies, if you develop great habits such as walking every day, riding a foldable bike, eating regular meals, and getting good sleep, you should see major health benefits! Getting your body moving is the most important first step in developing better health. You don't need tools to make this happen, all you have to do is MOVE! But, having the right tools at your disposal may give you the motivation you need to succeed. One great option is a simple set of hand weights. There are plenty of short strength training videos on YouTube that only require a set of 5 or 10 lb weights. K&J Trucking offers drivers use of foldable and portable bikes that can go right in your cab. These bikes allow you to explore areas that your truck can't and help you maintain an active lifestyle. They take up a tiny footprint so they are an easy tool to have around. 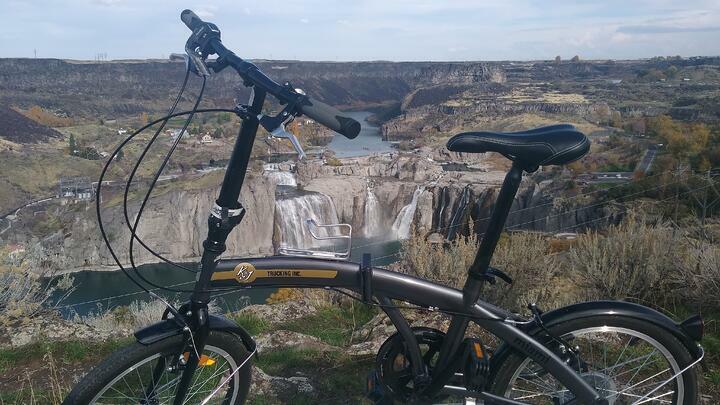 Here is a picture of one of our bikes that K&J driver Rodney Rich took this spring! Do you have just 4 minutes? Because that is all you need to help get you on the road to good health. Siphiwe Baleka is a trucker who has become a celebrity because of his unique 4-minute workouts for truckers. The best part is that Siphiwe's workouts are customizeable to your skill and fitness level and they don't require any special equipment. Click here to watch one of Siphiwe Baleka's workouts. Are you curious about what makes us different than your average trucking company? Click below to learn more about K&J Trucking.